Why Sri Lanka Educational Services ? As a diverse and multicultural country, Sri Lanka is home to many religions and ethnic groups. The culture is itself very unique and thereby contributes to the Sri Lankan identity among the international community. Sri Lanka is moving forward making the country more competitive in the global economy while retaining its proud historical records of traditions and values. 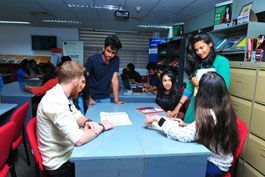 Sri Lanka as a fast developing country, has taken a number of initiatives to transform the education system to match the needs of a knowledge-based economy which has much to offer the students of its own as well as foreign. Establishment of several non-state universities has turned a new chapter in higher education sector and it can be seen a significant growth potential with the large amount of investments incurred by the government on expansion. You should obtain a valid student visa to study in Sri Lanka. Information on the procedure applicable in getting visa can be obtained by the respective Education Institute/ Agent or Sri Lankan diplomatic mission in your country. Foreigner intending to study in Sri Lanka should first contact the education provider and seek admission to a study program. Foreigner arrives in Sri Lanka. At the port of entry, immigration may grant entry for specified period. Upon entering Sri Lanka, before the expiry of the visa given at the port of entry, the passport of the foreigner should be referred to the Department of Immigration for the renewal of student visa. Sri Lankan Education Institutes have affiliated with hostels/apartments in the surrounding areas and provide support and guidance for you to find accommodation on request. Education Institutes have affiliated with local commercial banks in the aim of catering your financial management needs such as student loans and digital banking facilities. Education Institutes provide you the medical consultancy services. As a tropical country consists of very distinctive dry and wet seasons, the average temperature of Sri Lanka usually ranges from 28-32 degrees Celsius. The coldest months according to the mean monthly temperature are December and January while the warmest months are April and August. A wide choice of excellent restaurants can be found in Colombo and a few other places, serving a range of cuisines. Don’t forget to try out the street-side joints where you will often find some of the tastiest food. Apart from that, there are places with food courts which are the best places to hang out with friends ! Various entertainment alternatives are available in Sri Lanka. There are many shopping malls, cinemas, recreational parks spotted around urban areas where you can enjoy fitting to your budgets.